Though my plane according to the plans was complete, Monday I truly completed my aircraft! Outside of the plans, based on club members experience, I added support wires to the tail. You can see them installed in the featured image above. The reason for this addition is that a known flaw in the design of the aircraft is the weakness of the fin. If you were just flying in circles and figure eights you would be just fine but as soon as you started performing loops and rolls you would have a problem. That problem is that the forces applied to the fin during these maneuvers would cause the tail to twist making the aircraft unstable in the air. This instability, and perhaps damage, leads to a lack of control and I believe even the potential for the fin to break. The wires were created by John based on the ones installed on his 4 Star 60. He sautered the ends to bolt to the surfaces onto the wire. The are adjustable for length as you want to make sure they are at about the middle of the top of the fin as well as the middle of the outer edge of the stabiliser into solid wood, but not to close to the edge to ensure a firm hold. Doing one at a time you line it up and mark where the holes need to go into the stab and the fin. Adjustments needed to be made on the ends to ensure they sit flush with the surface of the aircraft. You then drill out the holes, ensuring you go through in a straight line as you don’t want to be at an angle. Next you put the screws through (screw it in once required) and then put a locking nut on the screw through the stab. Can leave the one through the fin for now. Tuesday was the day everything came together and I my aircraft was fully assembled. Previously in the week Peter & John balanced my plane to determine how much weight was required. The aircraft was quite tail heavy. Need to remember that as you move away from the center of gravity (CG) the effect of 1lb of weight is compounded. This means that even though the engine, wing, battery, etc. is all up at the front of the plane the tail still wanted to ‘sink’. In order to counteract this John & Peter determined how much weight was required to place up in the nose so that the aircraft is actually a little nose heavy. They determined the weight required and already had the one side of the piece of metal sanded and a piece cut out for the drain hose from the engine to go through allowing the fuel to exit instead of pooling on the bottom. I then drilled two holes into the piece of metal. In order to accomplish these two tasks a bigger hole had to be drilled for the speed adjustment extension as things didn’t quite line up properly (that is in order to give room for vibrations). Some other touch ups will now be required of the covering. For getting the throttle set properly, which means that at the one end of the throw you are wide open and at the other end you are at idle so that if you hit the kill switch it closes off the throttle shutting off the engine. This involved a lot of tweaking on both the mechanical and end point adjustments (on the transmitter) sides of things. We had to remove the engine to adjust the throttle “lever” by taking it off and putting it back on in a new position as it is geared. 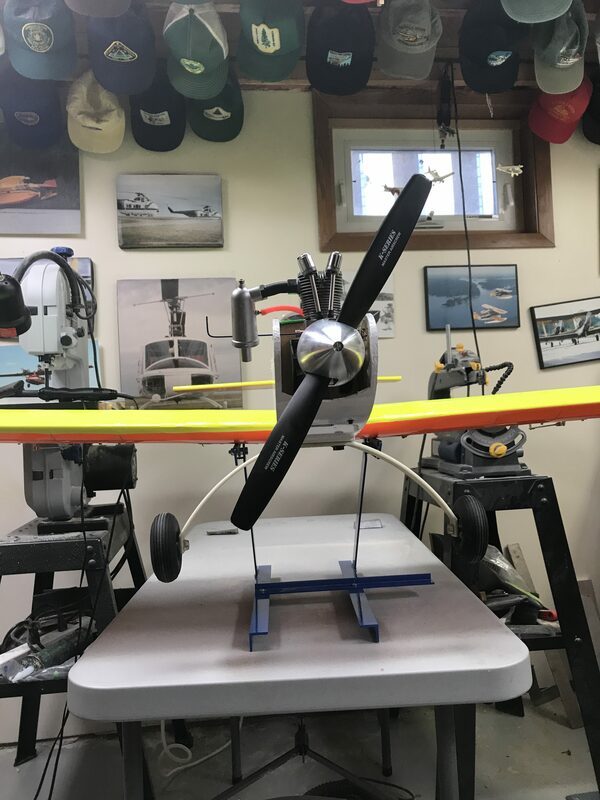 Peter also had the tail wheel installed for me already, see below, and on Thursday him and John did the balancing of the aircraft outside since it was a nice day and due to circumstances we couldn’t connect up so I could be there too. My task next time will be to install the weights they determined are required. After yesterdays session you can really get a sense of what my aircraft will look like (without the wing anyways). I started my day with covering the hatch cover. I wanted to break up all the white on the fuselage and since Peter and I had the same idea for what color should be used I went with green. Before covering I had to make sure that there was clearing for the throttle linkage which involved sanding down the one side. Once that was done I covered the surface and folded over the edges like I have done previously. This also means that for the front it involved doing a bunch of small cuts to get the covering folded over the curved edge decently. John came over to check things out and while he was there we bound my transmitter to the receiver. I haven’t installed that yet as John’s going to bring over some velcro for that task; however I know where it is going to go and already hot glued some tubing to the side of the fuselage to run the longer wire at a 90 degree angle to the other for reception. I set up a new model in my transmitter (named it 4Star60) and the various leads were hooked into the correct places on the receiver. 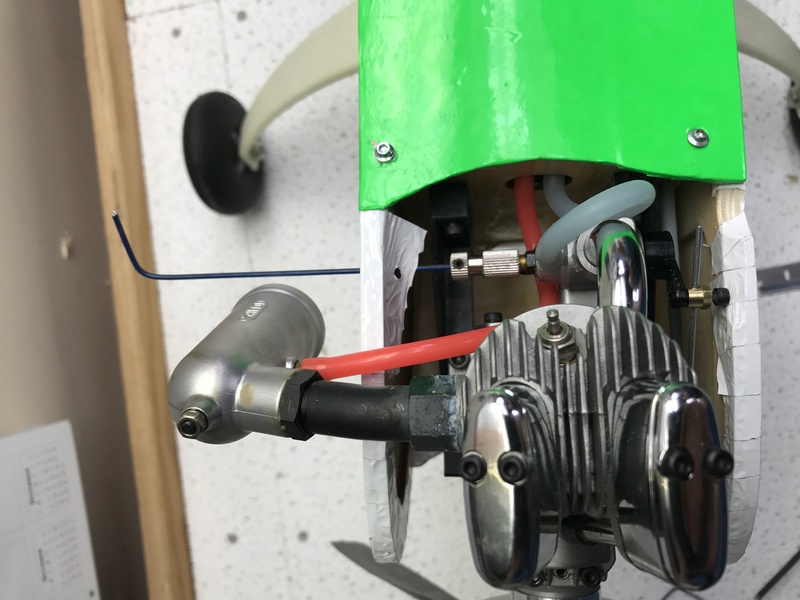 We were not able to get the desired effect for the throttle after doing endpoint adjustments on the throttle control arm and in the transmitter itself so will have to look at that again. 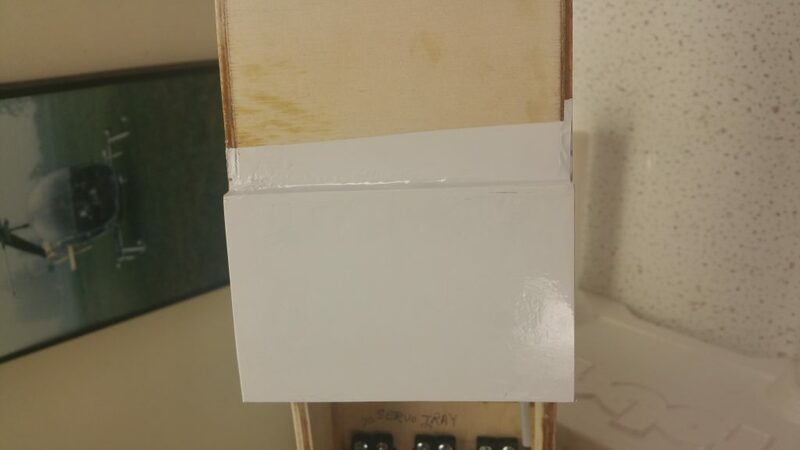 We were able to adjust the servos (mechanical adjustments) and the linkage near the control horn to get us satisfied with the movement of the rudder and elevator for this first crack at it. John had to go and then Peter and I hooked up the wing to test the ailerons. I had to reverse RAL so that when pushing the joystick left the plane would bank left (as was reversed originally). Tuesday was on the shorter side (1.5hrs) but accomplished the two goals that were set out for the evening, cutting the canopy and securing the pilot in place. The first task was to cut the canopy. This may sound like a simple task, but the thing to remember is that I only have one and if I screw up we have to order a new one. That said I took my time. It initially was curved such that it was flat with the ground all the way across and had an edge/lip all the way around. This would make it easier from a manufactures perspective as they just put it on the mold and walla! Every plane is a little different in how the top deck curves, etc. so this allows you to cut it to your aircraft. Peter mentioned some come with the canopy cut to size, but guessing there is more precision in the top deck and where it needs to sit? I had John’s canopy to use as a guide to get me started, but even then if I’d of cut it exactly like his it wouldn’t have fit my aircraft. First I lined up the front ‘band’ you can sorta see in the pic with John’s and marked where the back of his canopy was with a pen that I could clean off. I then cut out the enclosed part of the back and worked my way towards the pen mark taking out chunks, or as John likes to say hack-choo. There was a process finding the right tool to cut the molded plastic as Peter had no suggestions and I don’t know what others use (please comment and let us know!). What I ended up finding worked best for me were metal cutters with the straight blades, not the funkily curved ones (sorry I’m no Tim the Tool Man Taylor 🙂 ). It was great to get back working on my plane again. The time flew by as I think this was the longest I have worked in one session in a long time at about 2.5hrs. During this time I finished covering one side of the fuselage. From the pilots perspective this was the front left side, as seen in the featured image at the top. Due to all the curves you have to deal with when covering this area it is a slow and detailed oriented process. It starts first measuring out the piece of covering with some excess all around. Then you line it up to where you want it, about a quarter inch overlay with the back piece. I then tacked it down in a few places starting top middle and worked my way along the top edge, pulling tight to do some on the side and looking through the covering you can see where the outline for the wing to sit in resides to tack some along there as well. 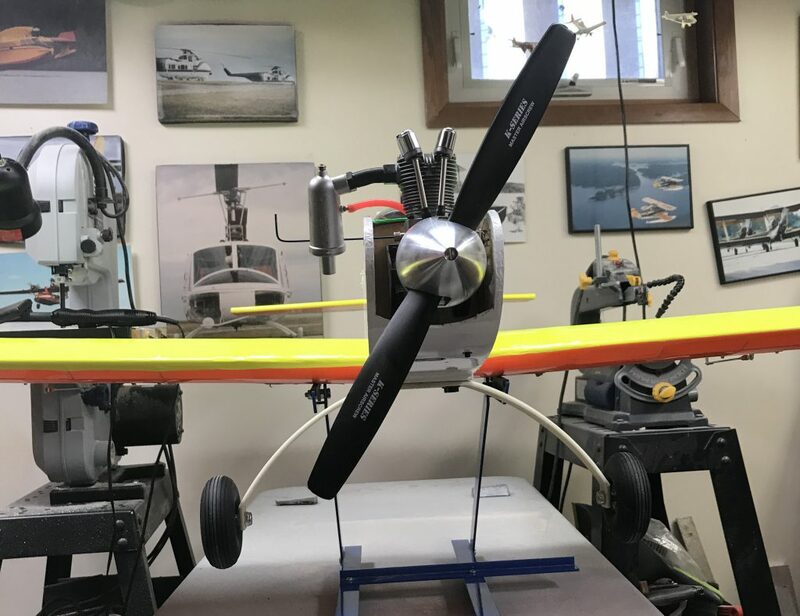 Today, after quite a hiatus do to not feeling well and timing, it was great to get back to working on my plane this afternoon. The theme of the day was covering, lol. I started by continuing where I left off and covering the fuselage bottom front, seen below. For this piece I made sure that I left about a quarter inch to wrap around onto both sides of the fuselage and enough excess at the front to get a little ways past where the “cut out arch” is. The main surface ironed down smoothly, I tacked it up at the top near the landing gear plate, pulled the covering tight and then tacked it down near the top of the arch. Then starting at the landing gear plate end I worked from the center of the fuse bottom out to the one edge and then the other working in this fashion towards the front. 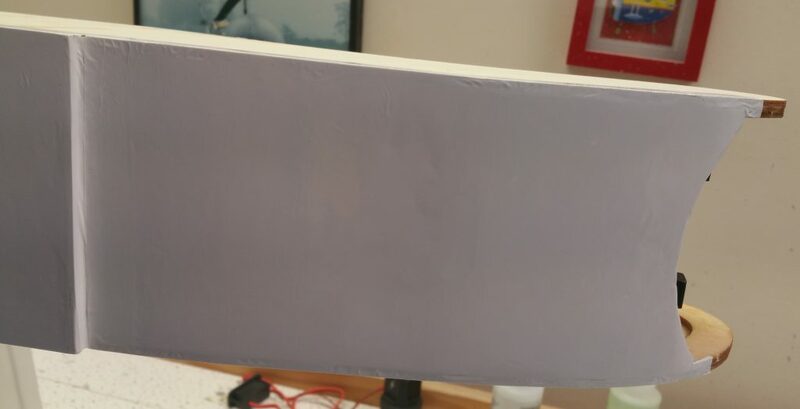 In order to properly iron the edges over the side I needed to make a couple cuts along where the arch starts working my way towards the front to allow me to iron over the edge and onto the side of the fuselage. I also made a cut near the front to allow me to iron the covering along the edge past the bottom of the arch a little ways and again over onto the side. This was then repeated on the other side. Next the bulk of the covering which was over the open space of the arch was cut away except for a tiny bit of excess. This excess was then cut about every centimeter or so (there was no exact measuring here), but frequent cuts were required in order to iron the covering over the edge to cover the ‘thickness’ of the sheeting to prevent wind from getting under the covering. Tuesday’s building session involved finishing up covering the turtle deck, top view in the image above, side view below. With the convex curves and having to extend back around the tail makes for one of the trickier pieces of covering I had to do.m Last session I had already cut out the piece, ironed it to the top stringer and cut for the slots necessary to get around the stabilizer and fin. I did need to make further adjustments throughout the process. To start this I pulled the covering tight along one side of the turtle deck and ironed the covering to the side of the fuselage (ensuring there is about a quarter inch onto the side) starting in the middle and working my way towards the tail, then going back to the middle and working my way towards the nose. Once that was done I ironed the covering half way around headrest. Rotating the plane around I did the same to the other side. I also ironed the covering down around the tail and ensured the perimeter of the entire area being covered was sealed (ironed down) so that it didn’t pull off once I started using the heat gun. Using the heat gun I worked my way around the turtle deck making sure not to stay in one spot to long or get to close to the covering as both scenarios can lead to burning a hole through the covering, which would mean starting all over again. I also made sure to point the heat gone away from the edges towards the middle. This means you need to be constantly moving and adjusting where the nozzle of the gun is pointing. The reason you do not want to apply hot air down onto the edges you previously sealed is that the heat will cause the glue to give way breaking the seam. I continued this process until I was satisfied with the tautness of the covering and removed any wrinkles or sags out of the turtle deck. John was over visiting so he cleaned up and got more wrinkles out of the covering down around the tail area as right from the start that shrunk into a mess of creases big and small! Thankfully I was able to work quite a bit of it out; with first the heat gun followed by using the iron again. 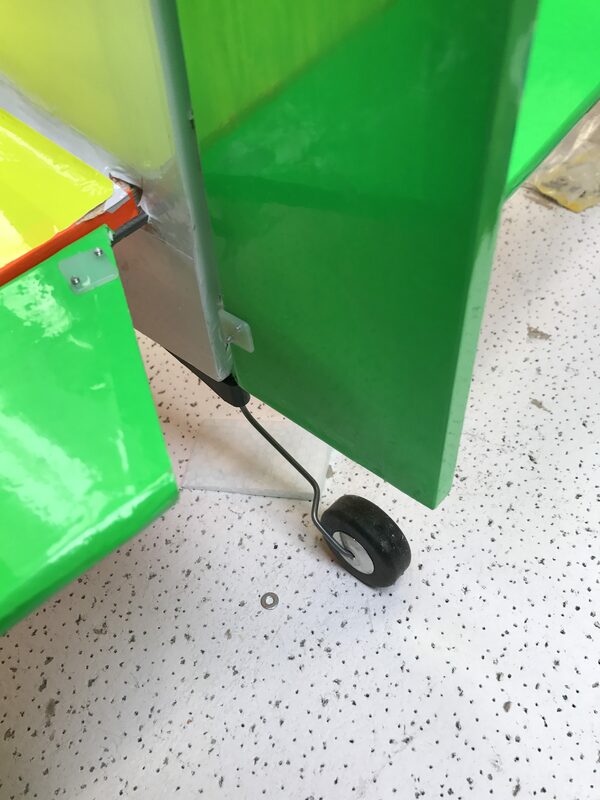 Afterwords I covered the landing gear plate with one piece measured to be big enough for some overhang on the sides and to cover down over the lip and onto the bottom of the fuselage a bit, seen in the pic below, as well as down over the lip into where the wing sits (2nd pic below). This is to ensure there is no unnecessarily exposed wood, protecting the planes structure from leaking fuel, etc. This was an awkward place to cover and I did the right side better than the left. Need to take the piece and angle up when folding over to allow for a tighter corner (with no wrinkles). I still need to cut the covering where the holes were are for the landing gear and wing bolts respectively. Today was a great building session and two Johns along with one other club member who stopped by for a visit today. Peter’s place was a beehive of activity! Through it all I chatted some, they conversed lots, and I kept working away to put in another 2 hrs on my plane. Today was about starting the process of covering the fuselage. 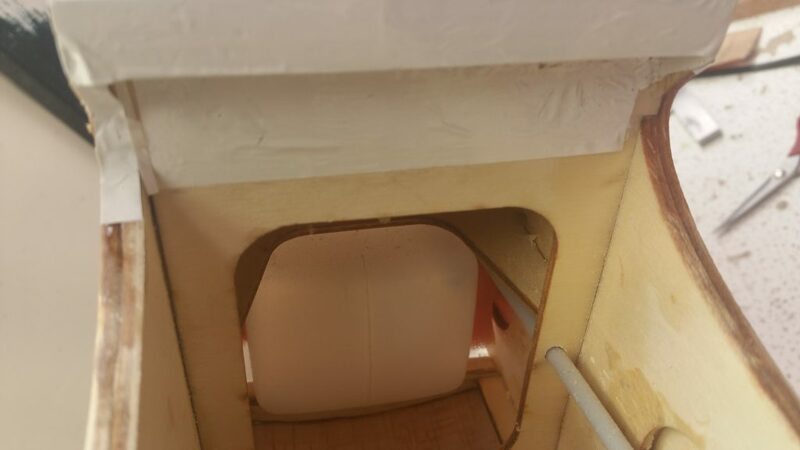 The first thing I did was measure the length of the bottom of the fuselage with about an extra inch at the front and about the same for the back which will cover over top of the existing piece. You want the front piece covering the back, which is why I started at the back and am working my way to the front of the aircraft. This allows the wind to roll over the aircraft without hooking and getting underneath the covering to peel it back.